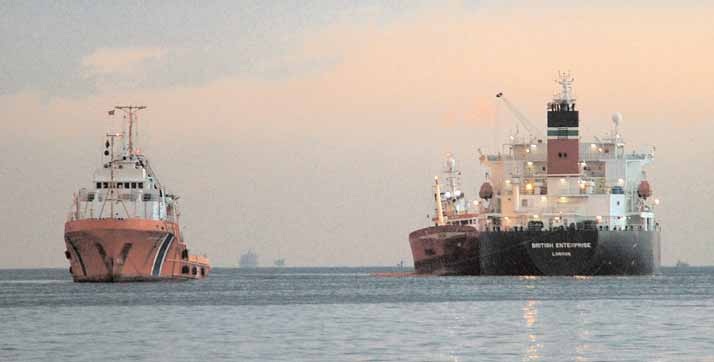 On 11 December 2004, at about 1405, the UK registered tanker British Enterprise grounded in the Port of Istanbul, Ahirkapi Anchorage Area. The vessel was aground for 5 days before she was floated off following a lightening operation. There was no damage to the vessel and no pollution. British Enterprise had loaded a cargo of crude oil at the port of Batumi on the Black Sea, and sailed at 0412 on 9 December bound for Agio Theodorio, Greece. The vessel passed southbound through the Istanbul Bogazi during the morning of 11 December. The master then advised the VTS he wished to take bunkers, and requested an anchor position. Permission was granted and he was instructed to anchor in “Charlie flammable cargo and explosives anchorage”. The master anchored the vessel in section C6 of the anchorage later that morning at 0546. Once bunkering was completed, and the barges were gone and clear, the master informed the VTS he was ready to depart, and was duly granted permission to sail from the port. The anchor was weighed at 1343, the master turned the vessel around using rudder and engine, and began proceeding out of C6 anchorage, intending to cross C5 anchorage before heading out to sea. She had a maximum draught of 11.17 metres. At 1405, as British Enterprise passed through C5 anchorage, the master noticed the vessel’s speed had reduced to zero and, realising she was aground, he immediately stopped her engine. The bridge team checked the position and, after confirming that the chart showed sufficient water depth for the vessel (between 13 and 14 metres), the master attempted to manoeuvre her clear of what appeared to be an uncharted shoal or obstruction. At 1440, the master realised the vessel was hard aground, and he advised the VTS of the situation. The master had noticed the vessel was listing slightly to port. 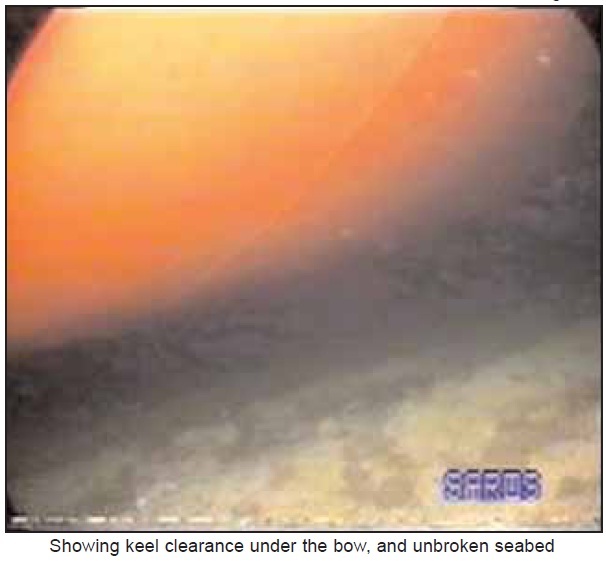 As the echo sounder indicated an under keel clearance of 2 metres under the bow, the master believed she was aground on a shoal under his starboard quarter. He ordered the chief officer to begin gravitating ballast water into a number of forward and port side segregated ballast tanks. About 1000 tonnes of ballast had been taken on board by 1520, but attempts to manoeuvre the vessel clear were still unsuccessful. The master then updated the VTS with a situation report. VTS ordered him to cease all ballasting and engine movements immediately. Pilots and port officials boarded British Enterprise later that day and informed the master that, if he was unable to re-float the vessel within 48 hours, the authorities would appoint a salvor. During the following 48 hours, the ship’s crew attempted to re-float the vessel using rudder and engine movements. They were unsuccessful. 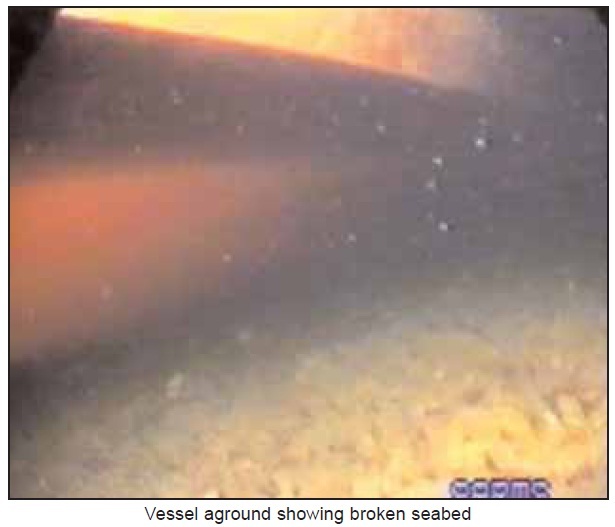 Divers entered the water at 1645 on 12 December, and recorded their findings on video. No hull damage was found, other than the hull coating being scored and scraped. Turkish authorities re-boarded British Enterprise at 2325 on 13 December, and the master signed a Salvage and Assistance Agreement (Turkish Open Form) with the state controlled General Management of Coastal Safety and Salvage Administration. During the following 3 days, ballast water and cargo were unloaded from British Enterprise into lightening vessels. The vessel was successfully re-floated at 1510 on 16 December. 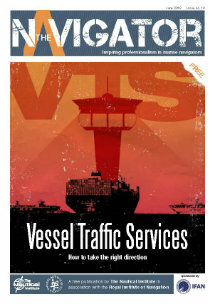 The vessel’s cargo was loaded back onboard, and the vessel sailed from the port at 2000 on 23 December. 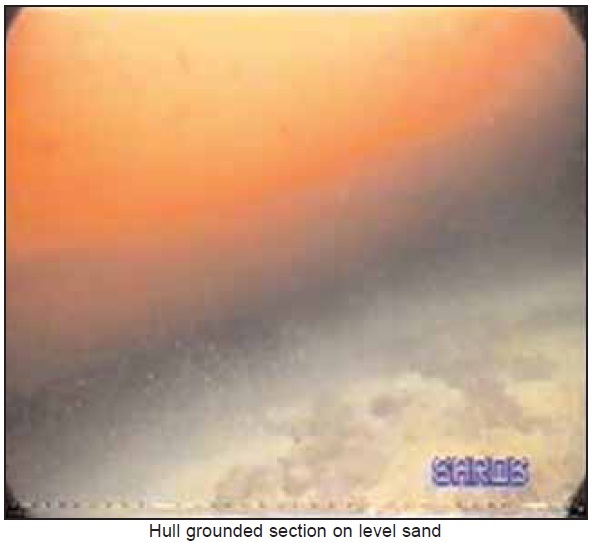 On the day following the grounding, the master had informed the UK Hydrographic Office (UKHO) of the uncharted shoal using a hydrographic note. The UKHO forwarded the information to the Turkish Hydrographic Organisation (THO) on 20 December. The area of grounding was later surveyed by the Turkish Navy and a bank with a shoal area with least depth of 6.1m was discovered. The difference between charted and actual water depth was such that the THO issued a notice to mariners on 29 January 2005 for all relevant Turkish nautical charts, which included a block for the largest scale Turkish chart. 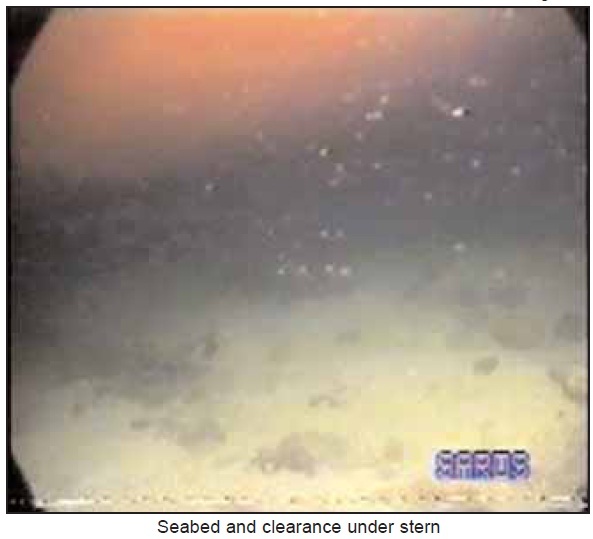 During the investigation, it was found that at least two other vessels had grounded in C5 anchorage in recent years. 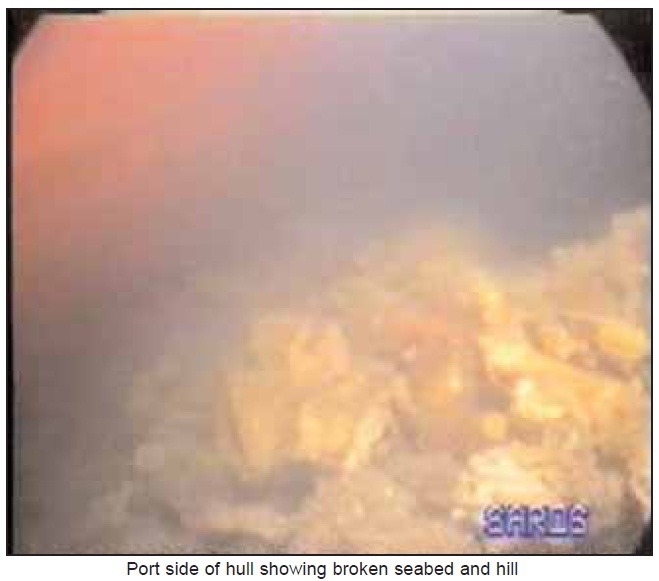 Investigations carried out after these accidents had not identified the shoal area. on modern charts. The area lies close to a geological fault line, and it is possible that seismic activity, and the very strong currents that can be experienced in the area, have combined to make the bottom topography unstable. A 1979 survey of the area failed to find any evidence of its existence. A note has been circulated to its fleet to remind officers to report any chart inaccuracies. A policy has been established that will ensure that an echo sounder display will be sited at the front of the wheelhouse clearly visible from the main conning position in all future new buildings. A cautionary note has been issued to its fleet which gives guidance with respect to ballasting a vessel that has grounded. Before granting permission for one of its vessels to bunker while on laden passage, a formal task risk assessment must be carried out by the vessel in conjunction with company marine and commercial superintendents. The company’s Ports and Terminals team now review Lloyd’s casualty data and other sources of industry information for any intelligence concerning navigation hazards. Moreover, recommendations have been made to organisations representing ships’ masters and officers to, among other things, ensure that uncharted navigational hazards that may be identified are promptly reported to the correct authority. In addition, a recommendation has been made to The International Harbour Masters Association to, bearing in mind the protracted time that can elapse between discovery of uncharted dangers to navigation and promulgation of the appropriate chart corrections, remind its members of the importance of harbour authorities and/or coastal states issuing appropriate navigation warnings.